AirZooka is very simple to operate, all you need to do is pull the built-in elastic air launcher and release it to shoot your Air-ball to the target. AirZooka will never run out of Ammo because it shoots only Air. With the pop-up site you can improve your aiming. Try your luck at indoor target practice or take aim at your friends with surprising accuracy. AirZooka requires no batteries or electricity. This AIRZOOKA changes colors via a small LED light! Changing color from green to purple, even red or orange! The Amazing Air Gun! 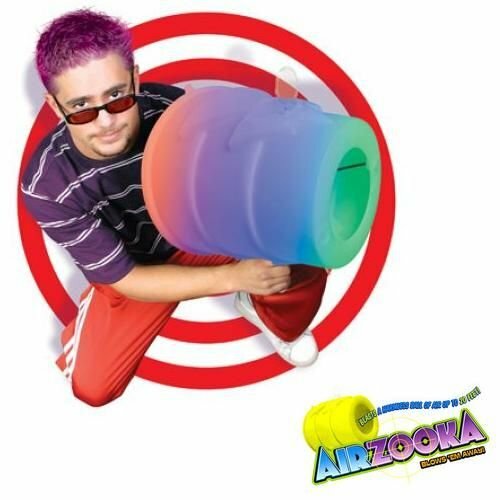 Description AirZooka is the fun gun that blows a harmless ball of air towards any object or person. You'll laugh with amusement as, seemingly from nowhere, you are able to mess up a person's hair, ruffle their shirt or scatter their papers from a distance... or just plain blow 'em away with a blast of harmless air! AirZooka is very simple to operate, all you need to do is pull the built-in elastic air launcher and release it to shoot your Air-ball to the target. Airzooka will never run out of Ammo because it shoots only Air. With the pop-up site you can improve your aiming. Try your luck at indoor target practice or take aim at your friends with surprising accuracy. Airzooka requires no batteries or electricity. This AIRZOOKA changes colors via a small LED light! Changing color from green to purple, even red or orange!